Hi everyone! Today I have some nail art I wore a little while ago to show you. If you've followed my blog for a while, you might know I'm a babywearing mama and very into woven wraps. Its kind of geeky I guess when you're not familiar with it, I guess like we could say about the nail polish world to 'muggles' lol. But anyway, I really appreciate the craftsmanship, fabrics, colours and patterns of woven wraps and I've already done nail art inspired by them. This time, I was inspired by a wrap I tried recently by the french brand Léora. 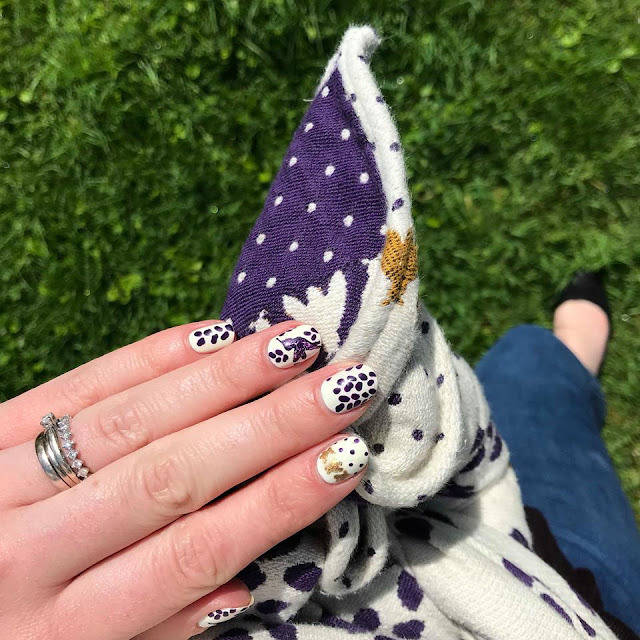 The wrap is called 'Aquarelle Petit Verdot' and is a gorgeous off white and vibrant grape purple wrap with the brand's signature hummingbird and bees Aquarelle pattern. I couldn't help but recreate it on my nails! I started out with 2 coats of Color Club Look, Don't Tusk and then freehanded the hummingbirds and the rest of the pattern onto my nails with Barry M Gelly Plum using a detail brush and dotting tool. I added the bees using Essie Good as Gold topped with OPI Goldeneye. I finished with topcoat as always. I was really happy with how these turned out and it was fun to photograph them with the wrap! I hope you like them too!